Visiting Chinese President Xi Jinping said Monday that his country and Venezuela should step up parliamentary and party-to-party communication and strengthen exchanges of governance experiences. He made the remarks during a meeting with President Diosdado Cabello of the Venezuelan National Assembly. Xi pointed out that exchanges between the National People's Congress (NPC) of China and the Venezuelan National Assembly constitute an important part of the bilateral relationship, which has just been lifted to a comprehensive strategic partnership. The international situation is undergoing profound and complex changes, said the Chinese president, urging the two countries to constantly consolidate friendly cooperation. Xi said the upgrading of bilateral ties, a choice made by both sides under the new circumstances, has opened a new chapter in the development of bilateral relations. China, he said, welcomes Venezuelan lawmakers. 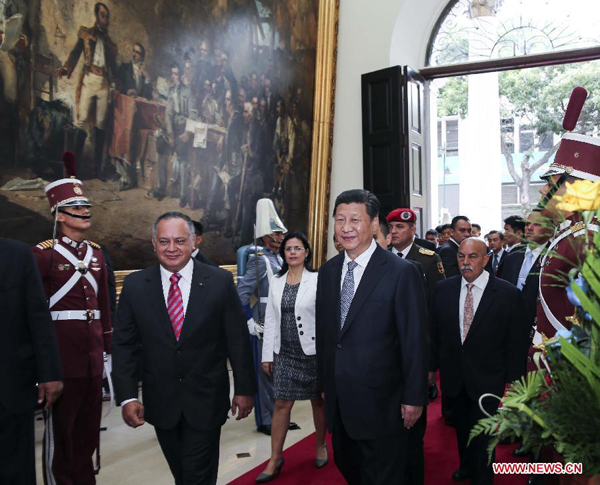 For his part, Cabello noted that Venezuela treasures the friendship with China and appreciates the Asian country's support and assistance to Venezuela. The National Assembly is resolute in supporting the bilateral partnership, and will vigorously implement the consensus and agreements reached during Xi's visit and strengthen communication and cooperation with the NPC. Before Venezuela, Xi paid state visits to Brazil and Argentina. He attended the sixth BRICS summit in Brazil, where he also met with leaders of Latin American and Caribbean nations. His current Latin America tour will also take him to Cuba.